Olaplex made those of us prone to colouring our hair sit up and take notice when Kimmy K managed to get her hair from dark brunette to stunning platinum blonde seemingly overnight (or, you know, over four days while she hid and had her assistants run out and do her errands). This, of course, inspired the rest of us mere mortals to rush to their nearest hair salon and demand the same results — which is every hairdresser’s worst nightmare. That is, until we discovered the little ‘miracle in a bottle’ that helped Kim achieve her look — the Olaplex No. 3 Hair Perfector. You can think of Olaplex as your hair follicle rebuilder. If you can imagine your hair follicle as a thin vine, blowing in the wind, external elements like heat, colour and rough combing can cause this vine to split and break down. When applied before, during and after colour treatment, Olaplex can re-strengthen this vine and rebuilt it from the inside-out. Another piece of good news about this already jaw-droppingly exciting product is that it can be applied to all hair types, including virgin, coloured, textured or highly compromised. The Olaplex No. 3 Hair Perfector is an ideal hair mask of sorts that will help fortify, smooth and protect your locks. 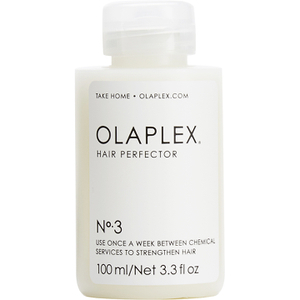 What’s the Difference Between Olaplex Nos. 1, 2 and 3? If you’ve read up a little on the Olaplex phenomenon, you’ll know there are actually three different formulas — aptly named Olaplex Nos. 1, 2 and 3! Each works slightly differently, so here’s a quick run-down. All treatments contain the same key ingredient, just in different dosages for their own distinct purpose. Olaplex Nos. 1 and 2 are available for professional use only. No. 1 gets added directly into the hair colour or lightener to protect and repair hair while it’s being coloured. Stylists also use Olaplex No. 1 as a standalone treatment on particularly damaged hair — it can be key to a total rebuild of the hair follicles! Olaplex No 2. is a cream formula, so can easily be applied after a colour service to restore the strength, structure and integrity of the hair. This is used by the pros, often post-Olaplex No. 1 to ensure a transformative, fortifying experience. Finally, Olaplex No. 3 is a take-home treatment that can be used to keep hair strong and healthy between colour treatments in-salon. Olaplex No. 3 is easily accessible by consumers, and you don’t need to have had either of the prior treatments to use it. It’s the most powerful at-home hair rebuilding agent on the market — just read the stacks of glowing reviews! So, you’ve picked up a little bottle of Olaplex No. 3 and you’re just dying to use it — we don’t blame you! Here’s exactly how you can start perfecting your hair from home with Olaplex. You can either start by washing your hair lightly with your favourite shampoo to rid your hair of oil and build up, or if you feel your hair is already clean enough, you can apply Olaplex to dry hair. However, if you apply dry, you’ll need more product to thoroughly saturate the hair. Apply a good amount to towel dried (or dry as mentioned above) hair and comb through gently. Leave to sit for at least 10 minutes. If your hair is extremely damaged (or if it just needs a little boost), you can leave the Olaplex on for up to 90 minutes. Rinse out in the shower, then follow up with shampoo and conditioner. Olaplex is not a leave-in treatment, and is meant to be followed up with your everyday haircare routine. The results you’ll experience post-Olaplex can be varied, but one common misconception is that it’ll leave your hair silky-soft like never before. Although Olaplex is sure to soften the hair a little, it might not be as soft as you’ve come to expect, as it’s not a hair mask or deep conditioner. Remember, Olaplex works from the inside out to repair broken hair bonds. What you should notice is that your hair is a little more manageable, and also that breakage is less obvious up-close. You might also reap some added benefits, like a burst of gorgeous shine! It’s recommended you use Olaplex No. 3 no more frequently than once a week, but you can also use it less frequently based on your needs. The results experienced from Olaplex are permanent, so the reconnected hair bonds won’t break on their own. However, the daily elements of your haircare routine can create damage and thus re-break the repaired bonds. These processes include styling with heated tools, over-brushing and colouring the hair. To help restore once again, simply grab out your trusty Olaplex No. 3 again and repeat the process. Will you be picking up a bottle of the Olaplex No. 3 Hair Perfector? Let us know over on Facebook or Twitter!